Google announced in its “Searchology” briefing event to the media that it’s combining search results from other Google web search services and properties including regular web search results, books, local information, images, news, and video to provide to users directly from regular web search form, said Marissa Mayer, Vice President of Search and User Experience. Previously, these results are separated and provided by specialty search engines from Google, where most users don’t even know of their existence. The universal integrated results will be used from now on to searches conducted on the main Google.com regular Web search engine. Localized search engine in English such as Google.ca, Google.co.uk is applied with new unified set of search results. Users won’t notice the differences too much, however, the universal combined search includes any site indexed by Google’s services, especially Google Video and YouTube video sites, which both readily owned by Google. The inclusion of videos are one of the major and significant change to the users of regular web search. 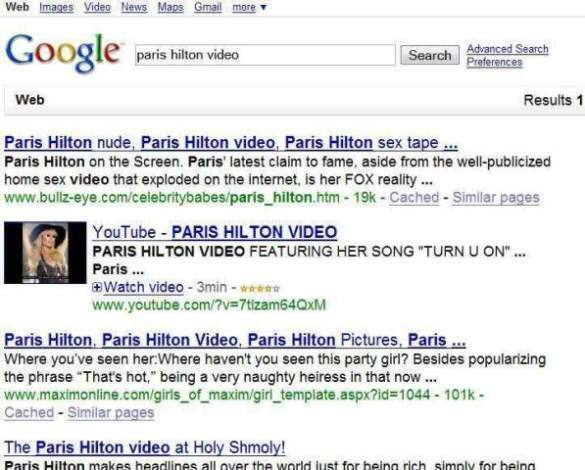 Universal search results for term “Paris Hilton Video” showing video contents from YouTube been inserted as part of the search results. However, to get the specific results for the specific media and property, users will still need to go to the specialty search engine such as the one for images, news or videos itself, make easy by the new navigation link on the new homepage design. The new contextual navigation bar is now located at the top of every Google page and will let users to quickly hop and switch between its different search properties and non-search services. For example, users of Google’s e-mail service, Gmail, can jump instantly to search, calendar, documents, and other services, according to a demonstration at the briefing. Other new upcoming products include a translation service that converts queries into other languages, or other languages into English allowing a user to comb a broader swath of the Web, according to Google’s Vice President of Engineering, Udi Manber. Once results are found, it can then be automatically translated back into the language of the original query. And interested tech-geeks can now play with Google search technology still in concept at Google Experimental (no longer available) available through Google Labs (no longer available). Current experimental technologies include timeline and map views, keyboard shortcuts, hand search navigation and right-hand contextual search navigation. The combining of search results from all medium by Google is the first move among major popular search engines such as Yahoo! Search and Microsoft MSN or Windows Live Search. However, whether the move will improve user experience is yet to be seen, especially for a researcher or student who doesn’t need any video or multimedia contents in their search results. There don’t seen to be a method to turn of the universal search.